Michelle Fisk began writing professionally in 2011. She has been published in the "Physician and Sports Medicine Journal." Her expertise lies in the fields of exercise physiology and nutrition. Fisk holds a Master of Science in kinesiology from Marywood University. Omega-3s are essential fatty acids that you can get by eating fish and some plant-based foods such as flaxseeds and nut oils. A study published in 2013 in "Plos One" showed schoolchildren with high levels of omega-3 fatty acids in their blood had better reading and memory skills and fewer behavioral problems. 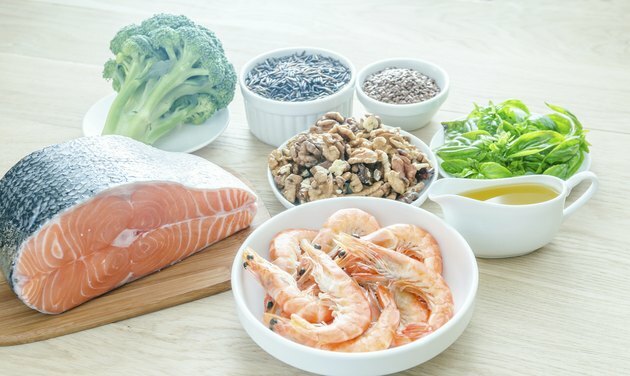 Serving more omega-3s sounds like a win-win for parents and children, but be wary of increasing your child's omega-3 intake too much because eating large amounts of these essential fatty acids can produce unwanted side effects. If you choose to give your child an omega-3 supplement, uncomfortable symptoms might occur. According to the National Center for Complementary and Alternative Medicine, omega-3 supplements could cause digestive issues, such as burping, indigestion and diarrhea. The Linus Pauling Institute reports that heartburn and nausea might also result from these supplements and, in some children, an allergic reaction. These supplements also have the potential to suppress your child's immune system, making him more susceptible to infections and other problems. Fish is one of the most common food allergens. Eating it can produce symptoms such as hives, itchiness, digestive issues, runny nose, sneezing and dry cough. Typically an allergic reaction is noticeable within minutes to a few hours after eating the food. The Food Allergy Research and Education website recommends avoiding fish oil if you are allergic to fish because it may contain traces of fish protein, which causes the allergic reaction in susceptible children. If your child has a severe fish allergy, he may experience swelling of the lips, tongue and throat, difficulty swallowing, shortness of breath, chest pain, loss of consciousness and weak pulse after eating fish or taking omega-3 supplements. This reaction requires immediate medical attention. Mercury poisoning is another potentially serious side effect from fish. Mercury is a neurotoxin found in some fish that can negatively affect your child's developing brain and nervous system, producing symptoms such as impaired vision and problems walking, hearing and speaking. To avoid high mercury levels, serve low-mercury, high omega-3 fish such as salmon, and stick to two weekly servings of fish that are each 1 ounce. High-mercury fish -- shark, tilefish, swordfish and king mackerel -- should be avoided. Omega-3 eicosapentaenoic acid and docosahexaenoic acid, which are mainly found in fish, provide the highest benefits to your child. Her body can also use alpha-linolenic acid found in flaxseed and other vegetarian sources, such as walnuts, soybeans and pumpkin seeds -- her cells convert it to the omega-3s, EHA and DHA. There is no recommended dosage of omega-3s for children, and foods vary in the amount of omega-3s they contain. Omega-3s also come in supplement form, but the University of Maryland Medical Center advises consulting with a physician before giving your child a fish oil supplement. Your physician can also help determine the correct dosage and advise you about any potential problems. Baby Center: Should Your Kids Eat Fish? Health Women: Can You Take Fish Oil Supplements if You Have a Fish Allergy? How Old Do You Have to Be to Start Taking Fish Oil?